Police shut down Long Beach Avenue in York as a nor'easter brings high seas and coastal flooding Friday, Mar. 2, 2018. 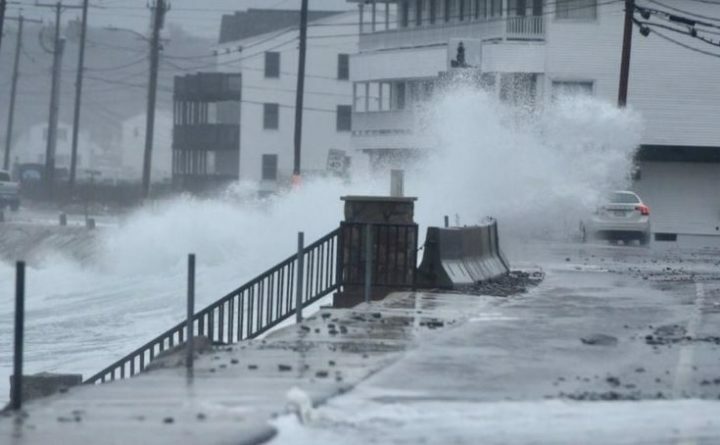 In Ogunquit, the nor'easter -- combined with three others that hit the state last month -- heavily damaged Marginal Way, which the town expects to cost approximately $335,000 to fix. The Ogunquit selectmen this week learned more about the extent of damage to the Marginal Way caused by nor’easters in early March, and the potential costs for repairs. Paul Breen, of the Marginal Way Committee, returned before the board Tuesday following a March 20 meeting where he and fellow committee member Joan Griswold presented the extent of the damage to the Marginal Way, which included shifted and eroded rocks, sections of the path that were torn apart and plantings that were damaged. Breen on Tuesday said, while many costs are yet to be determined, repairs are estimated to cost $335,000. This includes funds for a project manager to oversee daily operations, an engineering evaluation, and a 10-year survivability plan. He requested allocating $200,000 now to begin repairs. Breen said the board of the Marginal Way Preservation Fund, of which he is a member, is beginning an emergency appeal with a goal of raising $75,000. As of Tuesday, he said the emergency appeal has raised $20,000. FEMA funding is also being explored, Griswold said. The committee is also working with the Department of Environmental Protection to determine what work could begin now, and what will need permits. Select Board member John Daley suggested moving $400,000 from the town’s undesignated fund balance into the emergency disaster fund “so we can spend it when the time’s right.” Town Manager Patricia Finnigan said there is currently $112,000 in the emergency disaster fund. Finnigan said the board would have to advertise for and hold a public hearing on transferring funds from the undesignated fund balance to the emergency disaster fund. The board’s next meeting is April 17, she said. “We can advertise for the public hearing that evening, you can vote on it that evening,” she said.